Richcliff pavers impress with their signature flagstone texture, contemporary style and elegant, informal look. A combination of beauty and strength, Richcliff pavers are manufactured with Unilock Ultima Concrete Technology which produces pavers up to 4 times stronger than poured concrete. EnduraColor Architectural Finishes, a proprietary, two-step manufacturing process, gives Richcliff pavers a strong foundation and makes them highly resistant to wear and fading. Richcliff pavers’ ultra-realistic flagstone surface is achieved using a manufacturing process known as Reala Surface Technology, whereby the paver’s texture is cast from molds of hundreds of actual natural stone surfaces. Richcliff is available in the colors Dawn Mist and Pebble Taupe, as well as the ultra-modern Smoke Shale, which is new for 2018. Richcliff is ideal as a driveway paver as it is built for frequent traffic and heavy loads. However, its captivating good looks make it perfect for borders and accents as well. Artline pavers are manufactured using EnduraColor Facemix Technology, which gives the paver the best in terms of color strength and wear-resistance. With its plank-like shape and clean lines, Artline is a reflection of the trend towards minimalism. The paver is available in the colors Copper Ridge, Steel Mountain, Tuscany, Winter Marvel, and French Grey, as well as a 2 Color Blend (blended on site). Artline makes an excellent addition to contemporary style landscapes, and offers a fresh look with high graphic interest. 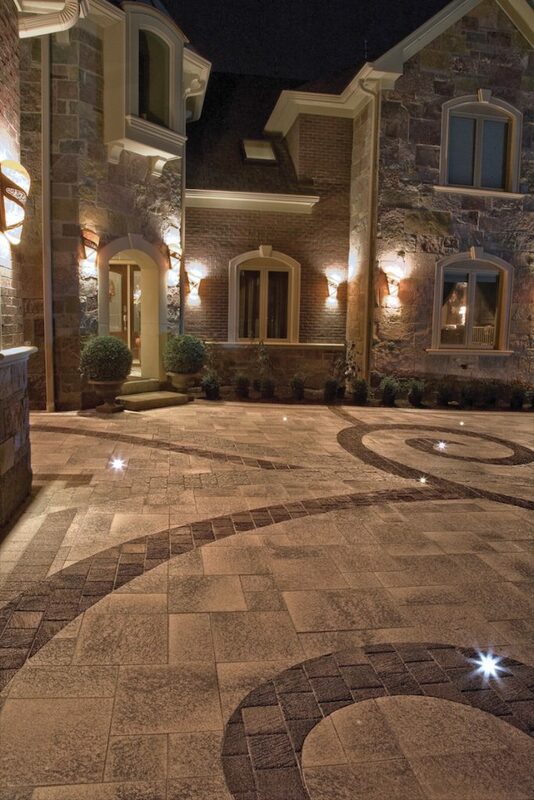 By providing the authentic look and feel of granite, Umbriano pavers offer the opportunity to create striking driveway designs. This paver is also de-icing salt resistant and unaffected by most chemicals. One of the reasons Umbriano pavers are a favorite among many homeowners is because of its vast design options. This paver works with virtually any landscape style and will make the driveway a centerpiece of the front yard while enhancing the property’s curb appeal. Umbriano’s wide color palette includes the dark shade of Midnight Sky, ideal for borders and accents, the radiating warmth of Autumn Sunset (special order), the neutral Summer Wheat, and the subtle Winter Marvel and French Grey. The Senzo paver comes with a subtle and modern matte surface texture. This paver is the ultimate next-generation paver, offering incredible aesthetics and superior performance. Senzo is manufactured using EnduraColor Plus Architectural Finishes, a complex blend of granite and quartz with color pigments that are highly resistant to fading and freeze-thaw cycles. The 8” x 8” size of this paver is ideal for accents and borders. Senzo is available in three color options, Castano, Cremo, and Nuvola, which create stunning contemporary driveways with sleek, elegant lines. The title image features a front entrance and driveway paved with Umbriano.